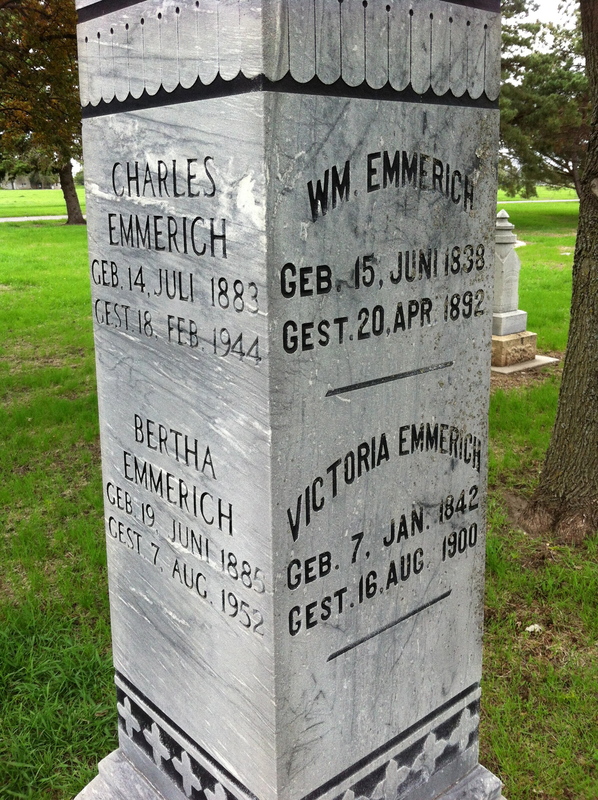 A monument from the New Ulm City Cemetery. If you want to practice your German translation skills, go to New Ulm. My book tour took me to New Ulm on May 16. I had two events: one at Orchard Hill assisted living community, and one at the public library. The group at Orchard Hill posed great questions and comments. As older people, they had some good stories about the days in which death was more ever-present (see my recent essay for the University of Minnesota Press blog on this very topic). It also seemed that almost everyone had some past connection to gravedigging. I heard a variation of “my ____ was a gravedigger” several times—it was usually a father or an uncle. This makes sense. In the past, in small, rural communities, you might have several people who pitched in to dig graves. It generally was not any one person who made it a career, like my dad did. Communities tended to form around the church, so it was usually a fellow parishioner who did the job—whoever had the time and physical ability. The guy who worked at a gravedigger in the Alexandria area. He remembered a guy who died over the winter. The family did not want to bury the body in the winter, so they stored him in the grain bin. Two little girls who died who were buried next to the house. Playing on a little hill on a farm, only decades later to find out it was an Indian burial mound. Lighting a fire in a steel tub to defrost a grave that needed to be dug in the winter. The fire might have to be tended a day or two before all the frost would be thawed. A little boy who died in the 1930s. The mortician came to the house to prepare the body. A professional photographer took a picture of the boy, probably the only photograph ever taken of him. The body was waked at home, and someone stayed near him all night. Some solution (perhaps vinegar) was applied to the face to prevent it from becoming gray and ashen. This makes me think I should go to these communities more often and record the memories people have of deaths and cemeteries. It was many years before I finally decided to get a gravestone for my mother. She had been cremated and her ashes had been buried on my grandfather’s plot unmarked. My grandmother and my uncle were buried beside my grandfather also unmarked–so I decided to have all their names and dates carved on the stone. When I was “shopping” for the stone I was surprised and not surprised at the cost! Then I saw a stone that had a shoulder cut out rather abruptly. It didn’t please the person who had ordered it originally. The frugal and creative side of me decided that 1) I hated to see this beautiful rose-colored stone go unused; and 2) I thought the cut-out would be a good place for a perpetual bronze vase in which I would annually place red roses for mom. So Grampa Red, Grandma Clarcy, mom, and Uncle Johnny are remembered by me and mine. It sounds like a beautiful stone, Sheila. I like objects that have some character, and it sounds like this stone has a lot of character in its imperfection. I’m glad your relatives now have markers. I think it’s important to have memorials, a place where we can go to read the names of those who have gone before us.